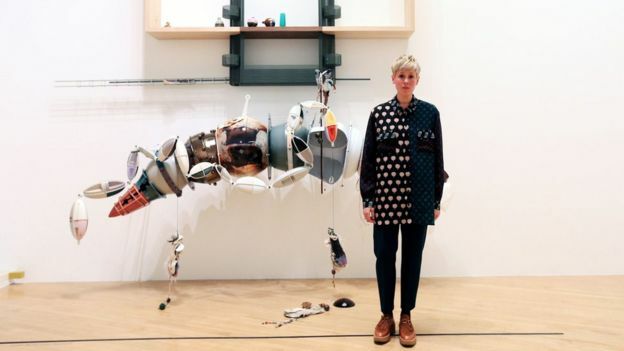 Helen Marten has won the Turner Prize, and has said she intends to share the £25,000 award with her fellow nominees. The 31-year-old, the youngest of the shortlisted artists, was announced as the winner at Tate Britain in London. The prestigious prize is awarded to a British artist, under the age of 50, considered to have put on the best exhibition of the past year. It is the second major prize in the space of a month for Marten, who also won the inaugural Hepworth Prize. 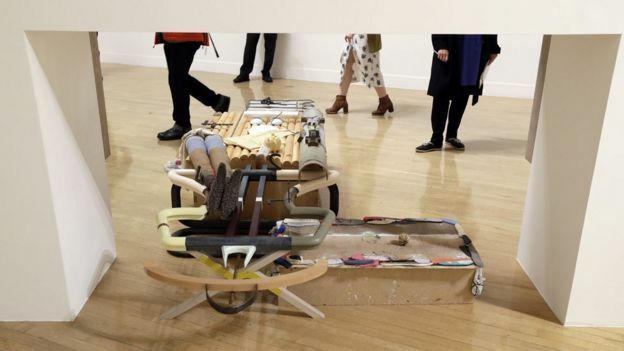 The painter and sculptor announced in her speech as she won the Hepworth Prize on 17 November that she intended to share the £30,000 money with her four fellow nominees, because she believes “the hierarchical position of art prizes today is to a certain extent flawed”. She told the BBC she also planned to share the Turner Prize – but felt she could only make such a public proclamation once. “This is something that can happen much more discreetly between the four of us,” added Marten. Accepting her prize from poet Ben Okri, Marten said she “wasn’t expecting” to win and that she could not think of “a more brilliant and exciting shortlist of artists to be part of”. Marten, who is from Macclesfield but now lives in London, faced competition from Anthea Hamilton, Michael Dean and Josephine Pryde for the Turner Prize, the aim of which is to “promote public debate around new developments in contemporary art”. Marten was nominated for projects including Lunar Nibs at the 56th Venice Biennale and her solo exhibition Eucalyptus Let Us In at Greene Naftali in New York. Speaking at the ceremony, she said: “Our global outlook is becoming ever more precarious and from the stripping of arts and creative writing programmes in schools syllabuses to the ever prominence of alt-right groups gaining a very visible and frightening political platform for a xenophobic, homophobic and racist outlook on the world. The runners-up each receive £5,000 prize money. 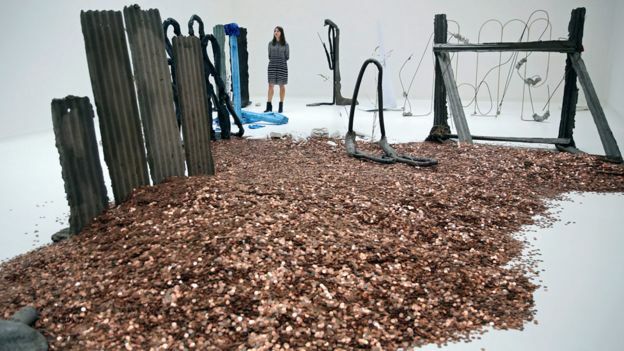 iWonder: Is the Turner Prize worth winning? Addressing the ceremony, Sir Nicholas Serota, outgoing director of the Tate galleries, said: “The strength of the Turner Prize is that encourages us to think about the world in new ways. 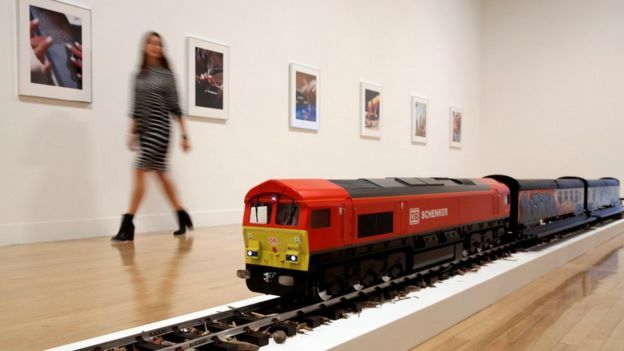 “At a time when there are fears that we in the UK may be becoming more insular and more inward-looking as a nation, the Turner Prize reminds us that art opens us to new ideas. He stressed arts and humanities need to play a central role in the UK education system and should not be “pushed to the margin”, adding the arts were “part of our DNA as a nation”. Marten’s installations shown at the Tate as part of the Turner Prize exhibition, which runs until January, included works made from cotton buds, marbles, snooker chalk and bicycle chains. 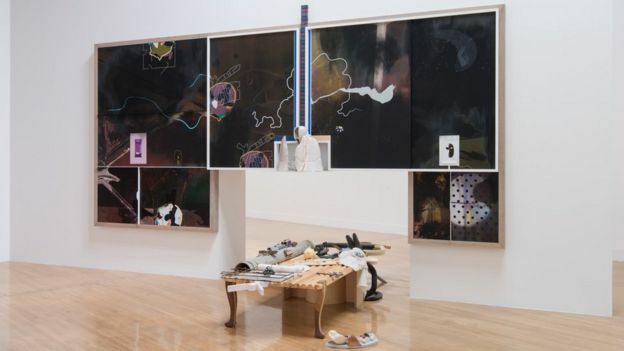 The Tate said that “her collage-like gatherings of objects and images have a playful intent, creating poetic visual puzzles that seem to invite us into a game or riddle”. The jury said her work “is outstanding for its extraordinary range of materials and form” and that they admired its “poetic and enigmatic qualities which reflect the complexities and challenges of being in the world today”. They added that Marten is “making an exceptional contribution to the continuing development of contemporary visual art”. The prize’s jury was chaired by Alex Farquharson, director of Tate Britain. He told the BBC Marten had been chosen as her work has “incredible virtuosity”. “She’s like a kind of poet when it comes to using materials, images and found objects,” said Farquharson. “The work is endlessly intriguing. Farquharson said it had been a “very strong exhibition” but noted that Marten’s work was “amazingly crafted”, and showed “how visual images, not just words, can be made to signify, to mean things”. “It doesn’t present you with an easy, simple, static view of itself,” he added. “The work is like reading very rich, very enjoyable, very elusive, quite enigmatic poetry rather than a very clear report on what happened in a newspaper. For someone who says she would prefer her work to do the talking, Helen Marten is spending a lot of time in the limelight. Last month she made national news as the winner of the inaugural Hepworth Prize for sculpture, to which she has now added one of the world’s highest profile art accolades, the Turner Prize. At 31 years old, she was the youngest artist on the shortlist – and, also, the most difficult to fathom in terms of her work. Her hybrid sculptures, made out of materials both found and fabricated, form a complex tableau of ideas and associations. They are poetic puzzles that question meaning and assumption, and require an almost archaeological mind-set to solve. She wants to jolt you, provoke you; throw you off balance. Anthea Hamilton, who lives and works in London, and was shortlisted for her Lichen! Libido! Chastity! exhibition at SculptureCenter, New York. The Tate said her sculpture, installation, performance and video bring “a surrealist sensibility to popular culture” and “seduce the viewer with comic and unexpected combinations of images, materials and words”. Josephine Pryde, whose work focuses on the meeting point between art and photography. Tate said it examined the idea of “art as commodity and of the seductive qualities of the wider art world”, adding that she “calls into question the conventions of the gallery”. The artist, from Alnwick, Northumberland, was nominated for her solo exhibition Lapses in Thinking by the Person I am at CCA Wattis in San Francisco. Michael Dean, from Newcastle, who was nominated for sculptures and installations made from “aesthetically overlooked materials” like salvaged corrugated metal from a shop shutter. The Tate said his work, seen at South London Gallery and de Appel arts centre in Amsterdam, is “concerned with the physical presentation of language”. Artículo siguienteWhy more young women are body building?